^ a b c d e f g h i j k l m Bryant, Christopher G. A.; Jary, David (2003), "Anthony Giddens", in Ritzer, George (ed. ), The Blackwell companion to major contemporary social theorists, Malden, Massachusetts Oxford: Blackwell, ISBN 9781405105958. Also available as: Bryant, Christopher G. A.; Jary, David (2003). "Anthony Giddens". Chapter 10. Anthony Giddens. Wiley. pp. 247–273. doi:10.1002/9780470999912.ch11. ISBN 9780470999912. Extract. ^ "Reality bytes". 16 June 2016. Retrieved 19 September 2016. ^ "High opportunity, high risk society! 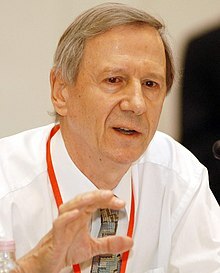 Interview with Anthony Giddens". sociology.org. 23 May 2016. Retrieved 19 September 2016.